A young yeti is lost in Tonale. 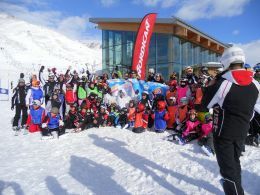 the Snowsports Academy from San Marino. Lombardy and Trentino, so distant and so different from its natural habitat. boys and told them his story and how he arrived in the midst of those tracks. the following day. The white giant looked very happy. and they seemed to be quite excited to help the white giant in this adventure. adventure that awaited them the next day. the search of the yeti: it seemd to be almost a treasure hunt for the slopes of Tonale. by Matteo and the Pink one by Alessandro. the chaos that characterized the Sunday the day of 22 January. 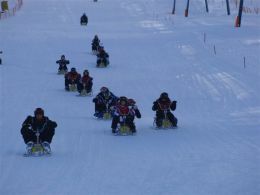 compete in an exciting race sleds next to the track. those bright colors on white snow, stopped to see what was happening. courage and went out into the open! is a thing that a yeti never does when he is outside from its natural habitat: his name was Michael. beautiful colorful swarm that descended along the slope in sync. so that the children will remember him even when he got home. with meat sauce, pork chops and chips.